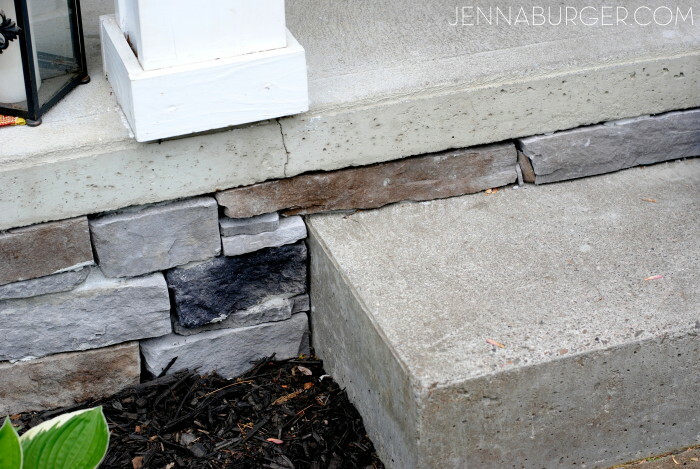 It’s typically for many homes – new and old – to have a bare, “naked” foundation wall at the gap between where the siding stops and the ground starts. Depending on the grade of the land, as little as a few inches or as much as 2’+ may be exposed giving an unattractive, unfinished appearance. 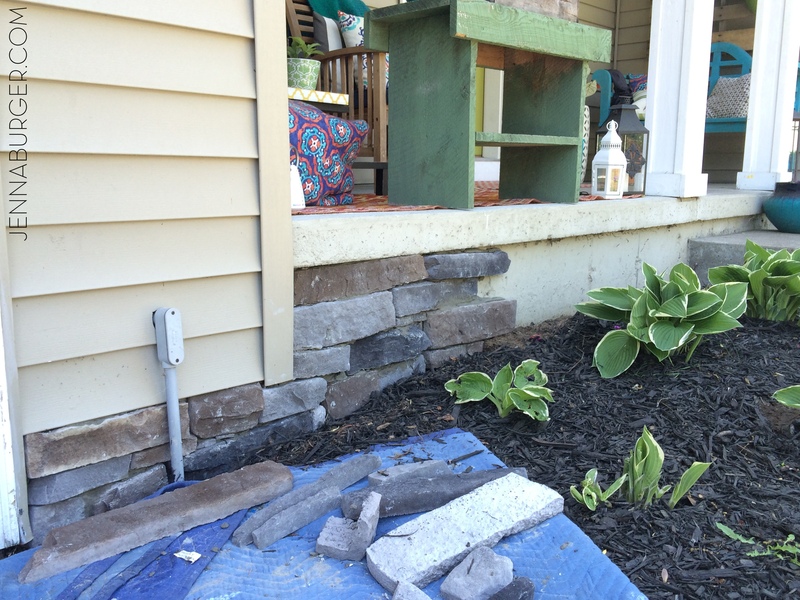 One way to make the plain wall look more finished is to add stone veneer to the foundation walls surface. 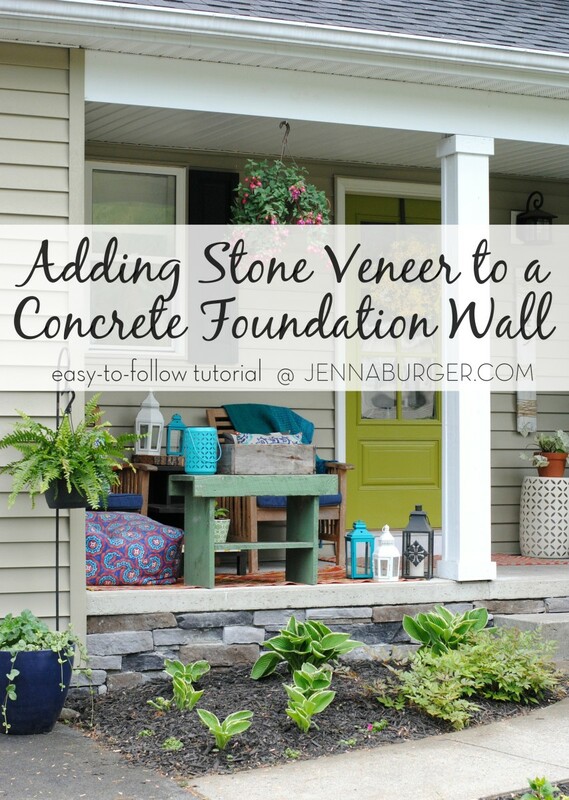 Stone veneer products, which are made from concrete, come in a range of colors + shapes and can be used for a variety of projects. 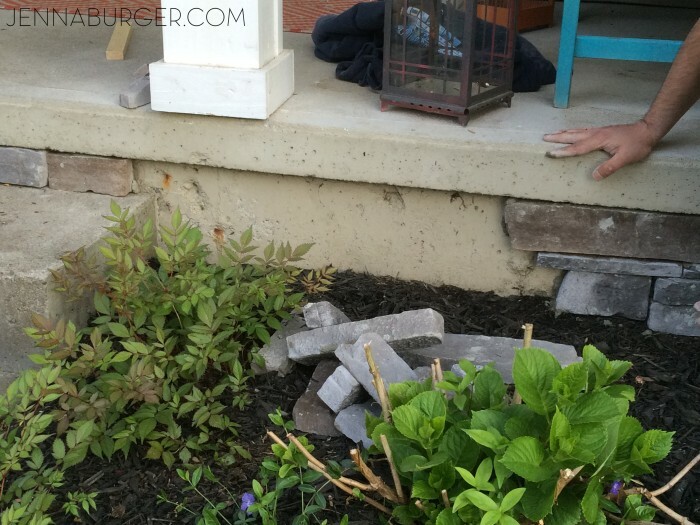 Their ‘pro’ is that they are lighter weight than real stone, less expensive, and only about 1″ – 2″ thick. And the best part of all… You really don’t need ANY EXPERIENCE to apply / install them. Check out the before & after on the far side of our front facade where over 2 feet of bare foundation wall was previously exposed. What a difference! The stone veneer I chose is StoneCraft Pennsylvania Ledgestone Flats from Lowe’s. 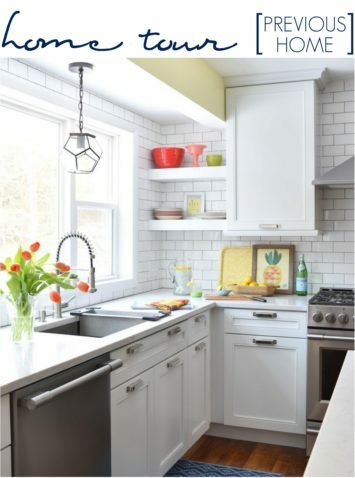 The coloring has touches of grays & blues, with a medium-range stone size in a horizontal, linear pattern. For the front facade only, I calculated about 45 square feet would be needed. 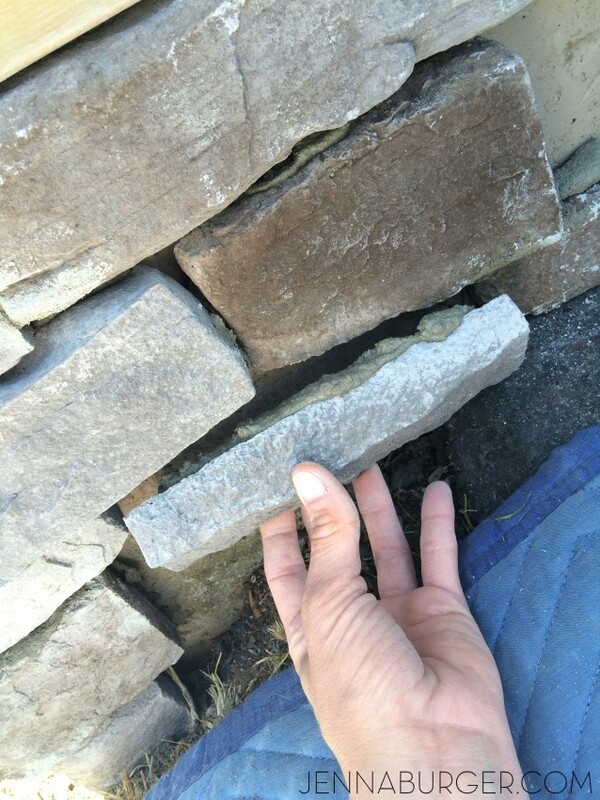 All the stone veneers at Lowe’s are special order and I ordered 6 boxes (@ 9 sq.ft. /per box), which gave me quite a bit extra for mistakes. In the end, I had a full box and a half leftover. Additionally, I ordered one box with corner pieces only. Each of those boxes covers 7 linear feet, but I only needed about 3′-4′ linear feet. 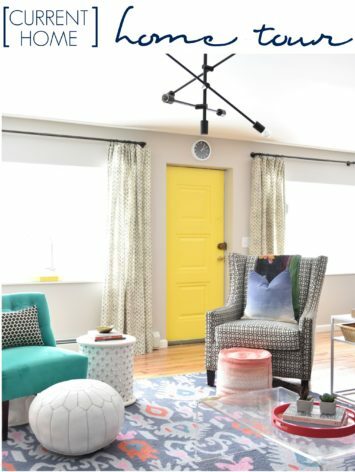 The most difficult challenging part of this entire project wasn’t the actual install, but instead creating a pattern with an even mix of sizes & colors. There was no tutorial or “how-to” for this so it took some thinking, looking, and analyzing along the way. 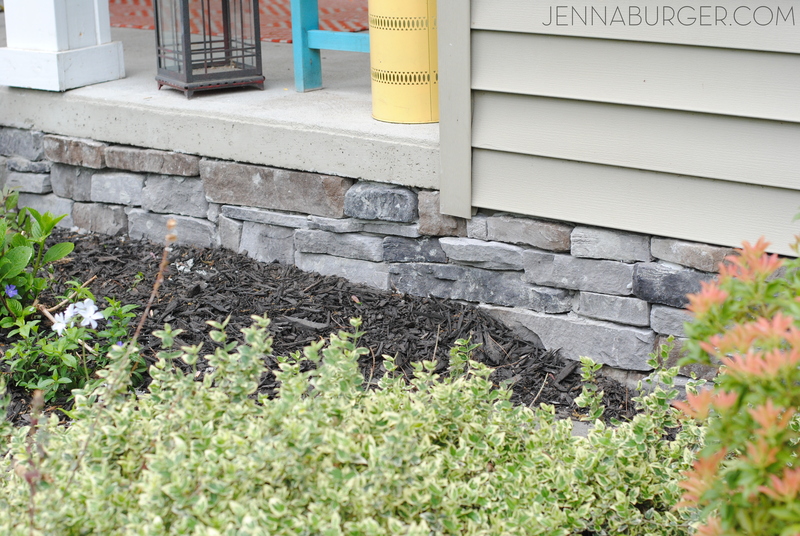 It’s important to vary the colors (in our case there was a mix of grays, taupes, blues, and blacks) and to vary the size + shapes of the stones. With the pattern we chose, we stuck with a linear, horizontal direction, but it was kind of like a jigsaw puzzle. 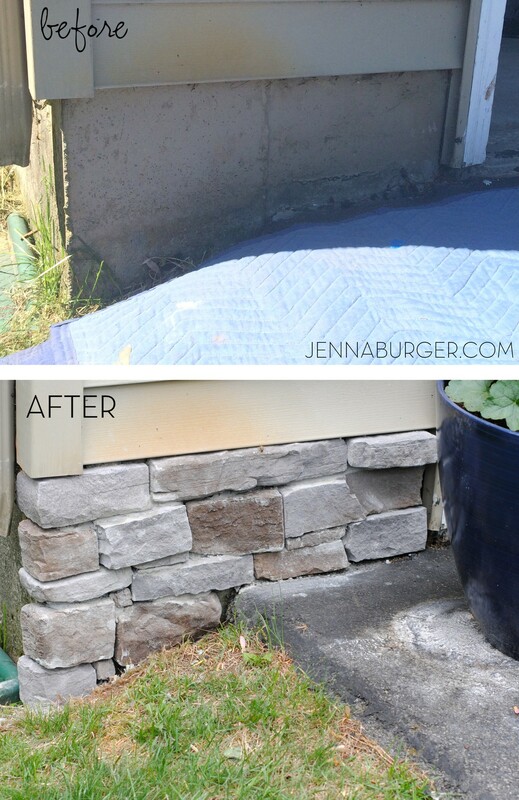 As we worked along from one end to the other, we would “dry install” a few stones, confirm we liked how it looked, then removed them to add the mortar. Important note: If you have corners, start with them first, then work your way over! 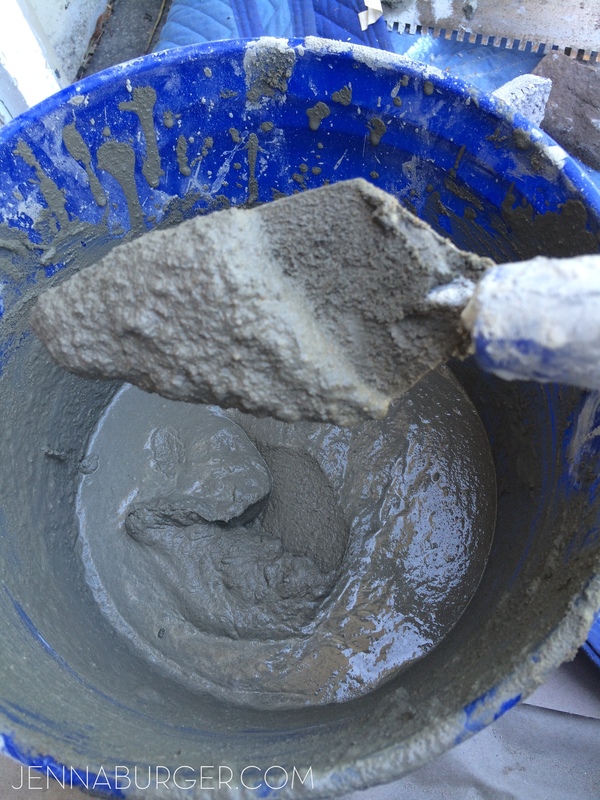 Using a large bucket (I used a 5 gallon bucket), add the mortar “powder”, then the water to make a mix that is pasty and that stays on the trowel without falling off when vertical. 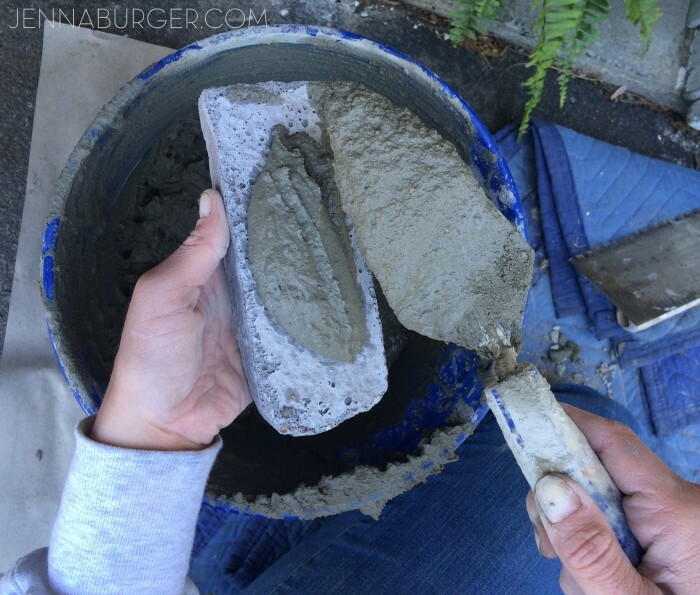 If there is not enough water in the mix, the mortar will not join the stone to the wall, but if it’s too watery, the mix will run right off. Sorry that I can’t be more specific or share an exact ratio, but it’ really trial and error. There is a mixing ratio on the back of the bag, but it’s for the entire bag at one time and I don’t recommend doing that unless you work fast, have a large area to cover, and plan on using it all at one time. 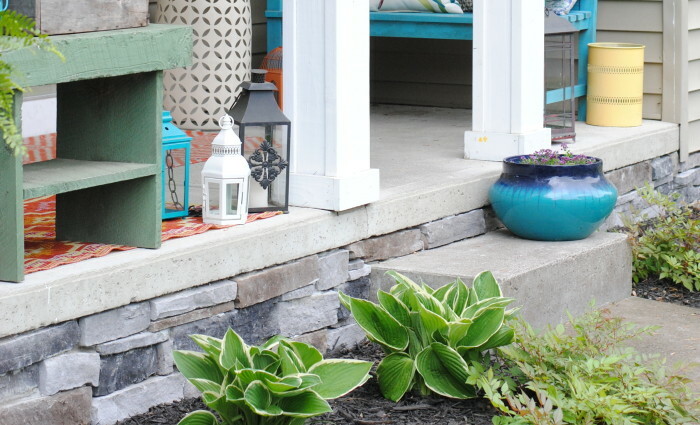 Once the mortar mix is ready, take a trowel and add a good amount to the back of the stone (the beauty of veneer is that the back is completely flat). 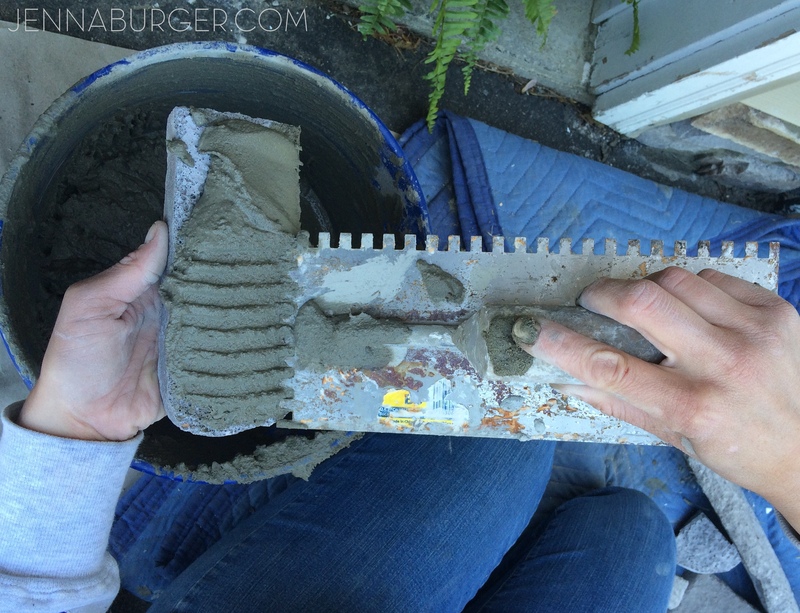 Spread out the mortar so the entire stones back is covered, then run the grooved section of the trowel over the mortar to create “ridges” which gives the stone a better adhesion to the foundation wall. Just as with tiling a bathroom, it’s inevitable that some stones will need to be altered / cut. 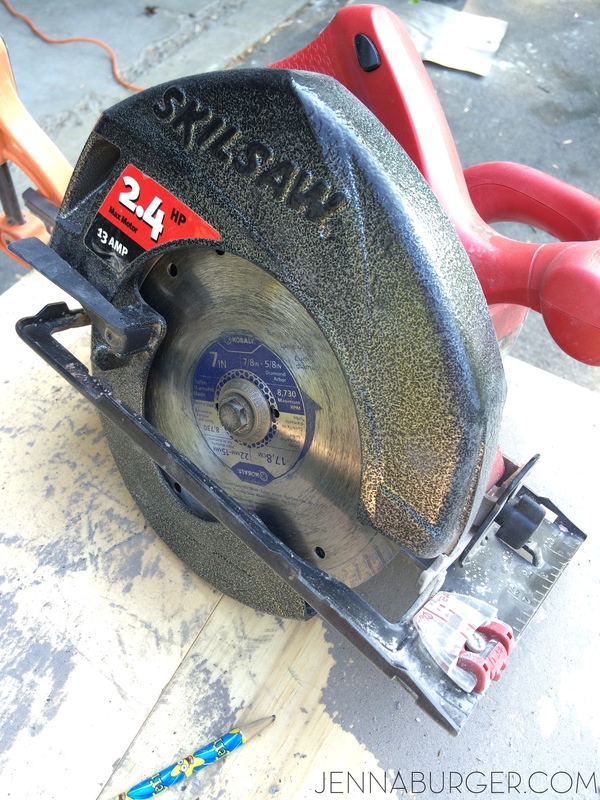 We used a Circular Saw (see my favorites tools) with a new Masonry Blade (it has an abrasive edge with no teeth) to cut the stones. It was fairly easy to do and took little time to make cuts. Be sure to clamp the stone down so it’s secure and slowly make the cut. 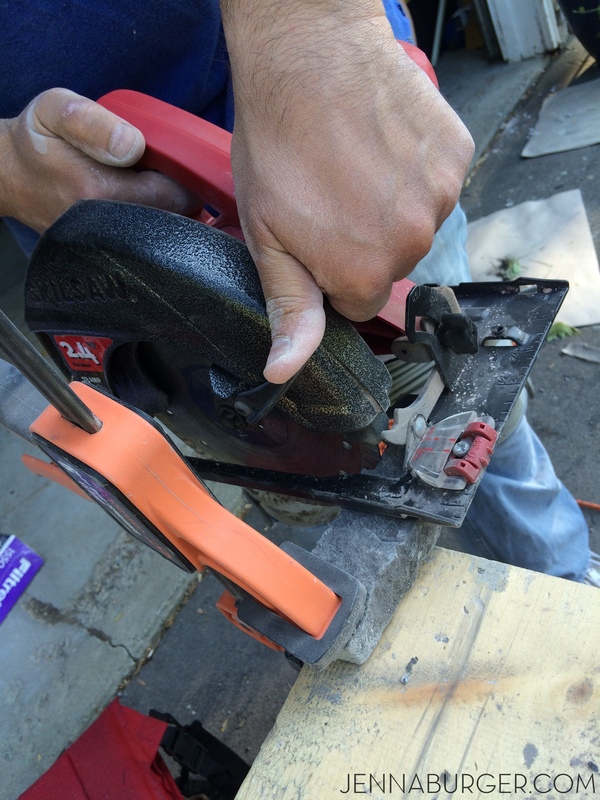 A Masons Chisel also comes in handy to cut small edges and/or make minor alternations. The total project took about 6 hours. At times it was tiring being on the ground so long + our backs and knees were quite sore the next day, but it was really all worth the effort! This was a 2 thumbs up project in our book. 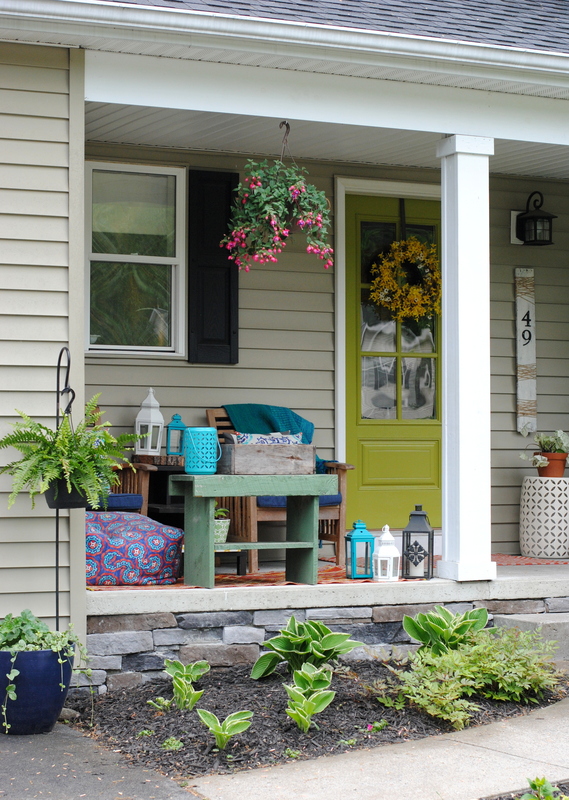 Curb appeal is so important to how it ‘speaks’ to those visiting your home (and of course to those that live there). 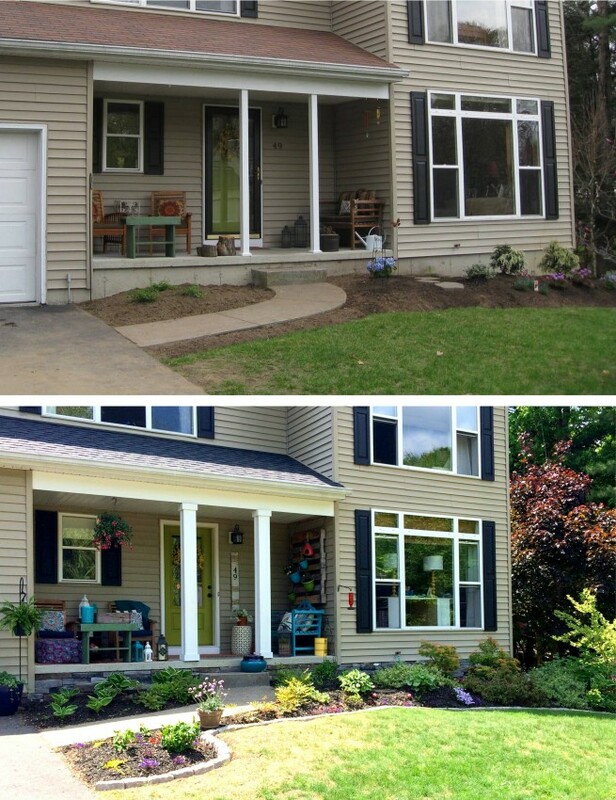 Yes for many, $700 is a lot of money, but in the long term the addition of the stone veneer to the front of our home has made a big impact on the overall look. 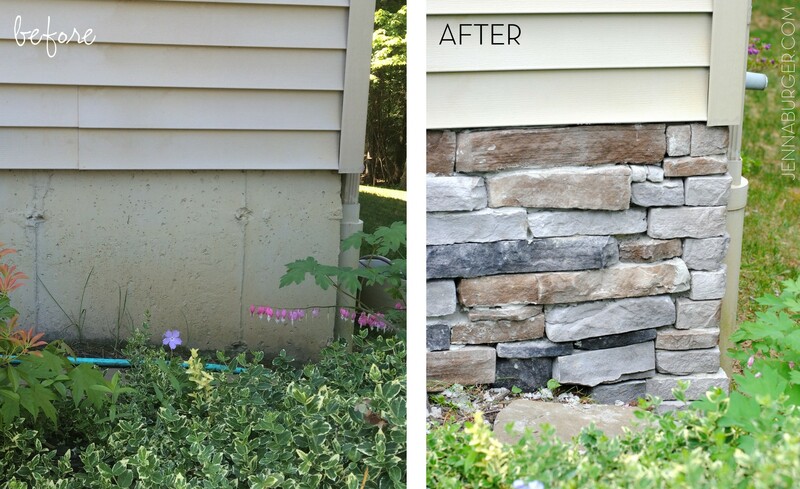 The new stone veneer absolutely enhances the front facade of our home and looks like it’s always been there. It’s a beautiful complimentary addition to the other changes we’ve made! Can I say, ‘I think we’re done outdoors?’… Not quite yet. All the big + more involved outdoor projects we wanted to tackle this year are finished, but I do have a few ideas that I want to focus on for the deck in the back of our house. That will be a in a few weeks. For now, I just need to put my feet up & take a breather so I can truly enjoy what’s been accomplished. What a difference!!! looks great!! 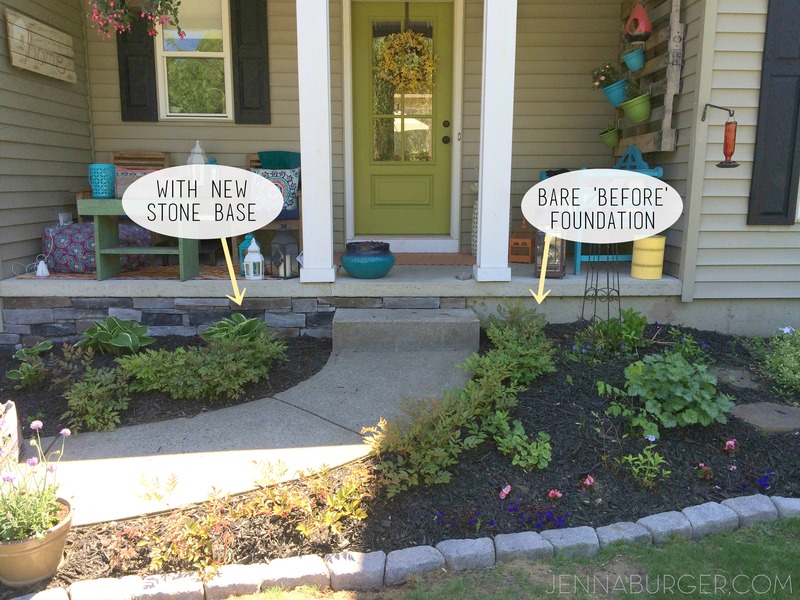 Wonder if I could use slate to do this?? We have a lot of it laying around here and am thinking it might just work? Thanks so much Lori. I am not sure if it would work with slate since I’ve never tried it. 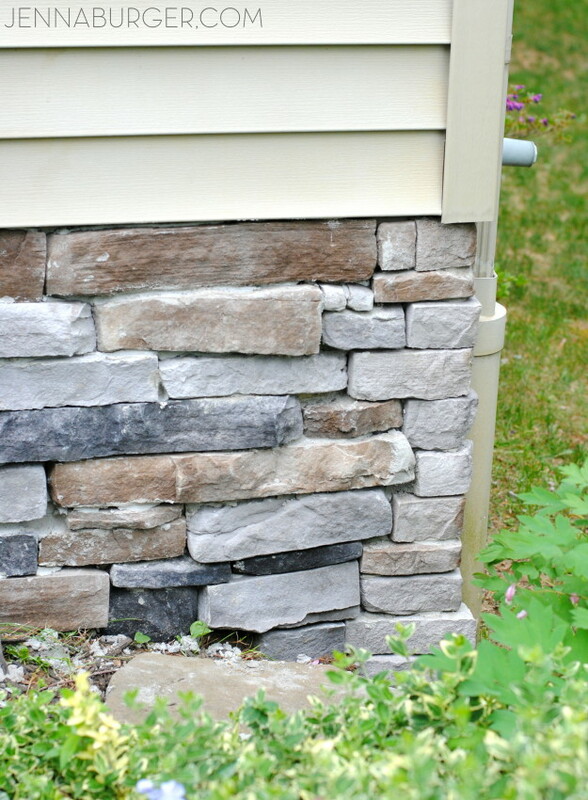 The beauty of the stone veneer is that it’s fairly thin (only about 1-2″ thick) and has a flat back. 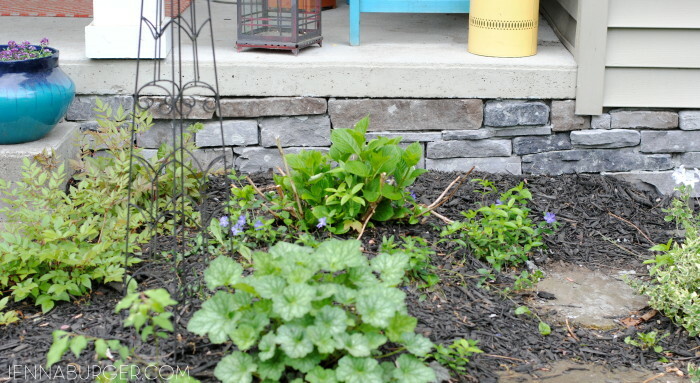 Give it a try though in a small area and see how the slate adheres. 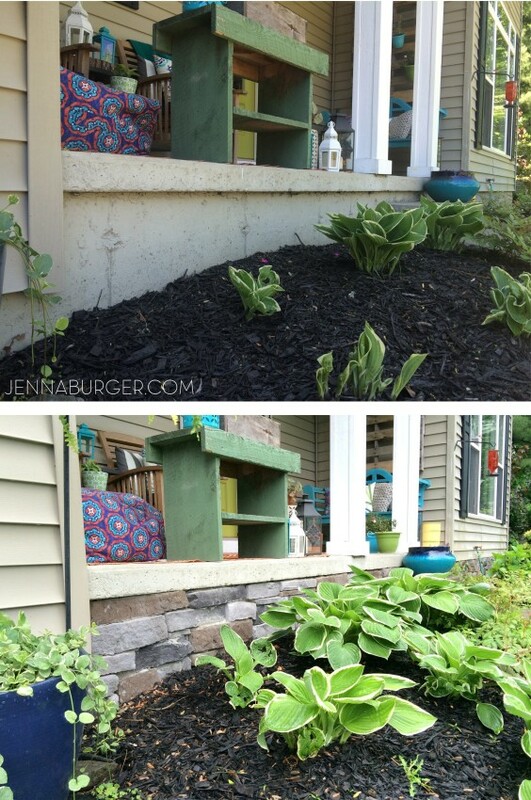 Great work Jenna. 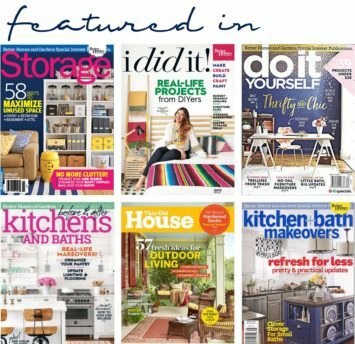 You saved yourself hundreds of dollars with this project. 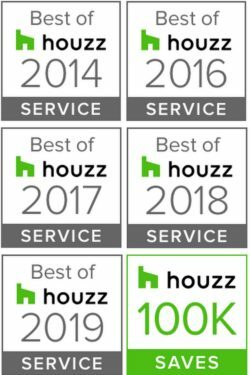 But of course, if you don’t have the convenience of time, you can always hire professionals to do it and just provide them what you want to do. Good job in getting your hands dirty!